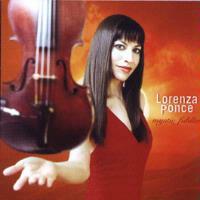 Lorenza Ponce has a pretty impressive resume. She has played with such artists as Kitaro, John Tesh, Sheryl Crow, Sarah McLachlan and Star People. Her album is a wonderful mellow sort of progressive rock oriented release. It is not for those who like their music hard edged, but if you are into the more mellow and accessible progressive rock, you will like this one. Ponce is wonderful both in her vocal performance and violin work. The music composition and arrangement is quite strong, and she has surrounded herself with fine musicians. A killer Eastern tinged acoustic arrangement makes up the musical theme for this ballad. This cover of the It's A Beautiful Day classic is a killer, symphonic prog oriented reworking. This cut is quite strong and Ponce's voice is a perfect fit. Beginning with a haunting violin/vocal combo, this cut jumps into a killer acoustic arrangement and strong Old World leanings. A sitar adds a great '60's feel. This instrumental is very strong. Coming in with a tone that combines prog with old world textures, this drops to a mellow, but quite dramatic folky balladic arrangement. It gets very lush and dramatic and features some killer textures. This cut has a wonderfully lush accessible mode. It is a very entertaining refreshing piece. This piece feels a bit like Tori Amos. It is a good mellow number, but not exceptional. Haunting violin tones begin this cut, and as guitar enters the tone is that of a sad ballad. The percussion brings in a more cheerful flavor, but the violin still imparts a certain melancholia. The tone changes as the violin leaves for a time, becoming a new age/jazzy style. This instrumental gets very dramatic and dynamic while still staying true to its roots. Starting with an almost playful folky texture, this song is a laid back, but highly creative number. It covers a lot of musical ground in a great jam. A sedate composition, this one has a killer percussive texture. A gentle and pretty ballad, this one gets quite lush in its arrangement at times. Very heavily string oriented, this song has a strong neo-classical presence and a rather melancholy tone. It is an elegant and pretty instrumental.